My research centered on groups whose singular focus was promoting all manner of cyber fraud, but most especially those engaged in identity theft, spamming, account takeovers and credit card fraud. Virtually all of these groups advertised their intent by stating well-known terms of fraud in their group names, such as “botnet helpdesk,” “spamming,” “carding” (referring to credit card fraud), “DDoS” (distributed denial-of-service attacks), “tax refund fraud,” and account takeovers. Each of these closed groups solicited new members to engage in a variety of shady activities. Some had existed on Facebook for up to nine years; approximately ten percent of them had plied their trade on the social network for more than four years. Here is a spreadsheet (PDF) listing all of the offending groups reported, including: Their stated group names; the length of time they were present on Facebook; the number of members; whether the group was promoting a third-party site on the dark or clear Web; and a link to the offending group. A copy of the same spreadsheet in .csv format is available here. The biggest collection of groups banned last week were those promoting the sale and use of stolen credit and debit card accounts. The next largest collection of groups included those facilitating account takeovers — methods for mass-hacking emails and passwords for countless online accounts such Amazon, Google, Netflix, PayPal, as well as a host of online banking services. 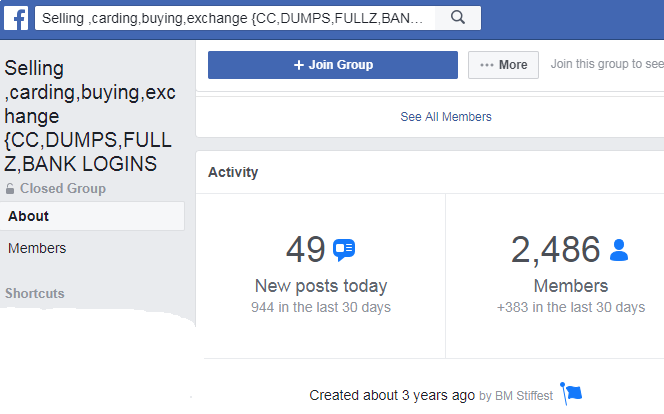 This rather active Facebook group, which specialized in identity theft and selling stolen bank account logins, was active for roughly three years and had approximately 2,500 members. In a statement to KrebsOnSecurity, Facebook pledged to be more proactive about policing its network for these types of groups.